There are a lot of gadgets that people can wear instead of simply carrying around with them or in their pockets. But these gadgets are not exactly what would be defined as chic. The smartwatches are chunky, glasses look unflattering and jewelry seems outrageous with technological modifications. But all of that might change after the Mercedes-Benz Fashion Week. London based fashion house CuteCircuit is taking wearable technology to the the next level, they are actually making the geek look chic. Their new products bring together the worlds of fashion and technology to create something trendy and not just functional. Some of the models at the show had iPhones in their hands which allowed them to change the colors of their outfits, or make them glow or play a video. The designer Francesca Rosella used the technology in a smart and conservative manner to allow the clothes to keep their natural appearance while being able to do something more than ordinary clothes. 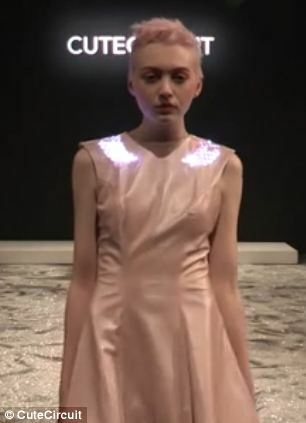 She used micro-LED lights and conductive nylon ribbon which removed the need for wires. The batteries were disguised as buttons or clasps, which allowed the clothing to be made with traditional fabrics. The outfits were controlled by the smartphones via an app and Bluetooth, allowing users to control the many features of each garment. The app, which will be available in the Apple Store in the future, will allow users to control the whole line of smart outfits. You can see a clip of the clothes below. The people at CuteCircuit already have celebrity clientele, such as Nicole Scherzinger, who wore the famous Twitter dress in 2012 that displayed live updates. The dress was made of French silk chiffon and contained 500 Swarovski crystals and over 2,000 LEDs. Maybe one day we’ll all be wearing clothes that can play our favorite video clips and glow in the dark.